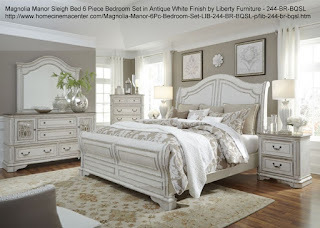 The Magnolia Manor Collection by Liberty Furniture offers gorgeous antiqued styled group that will bring charming aura into any decor! The furniture is made of Poplar Solids and Birch Veneers in Antique White Finish with White Oak Veneer Tops giving it a two tone look. The cases feature Canted Corners, Framed Drawer Fronts, Bead Molding, Rounded Pilasters, and Bracket Feet. 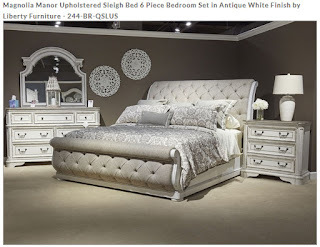 The beautiful bed features Sleigh Headboard and Footboard with Scrolled Cap Rail. Drawers are provided with Antique Pewter Knob Hardware. Enjoy this magnificent collection in your home! 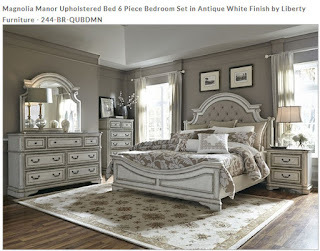 You have shared beautiful designs of Antique White Finish bedroom furniture. Your article provides the great idea about the latest designer furniture. If you are looking for the furniture stores in san jose, What a Room is the best choice. Thanks for sharing the post on home cinema center. Get the leather dining chairs for your home from Burgessfurniture.